As the saying goes, the road to success is always under construction. And by following this mantra, Steve John Wolfe has progressed from hobby bush horseman to one of Western Australia’s leading thoroughbred racehorse trainers. A shearer by trade, Steve is a self-taught trainer and surprisingly has never been on the back of a horse. But that hasn’t stopped him preparing feature race winners from Broome to Esperance and developing his stable into one of WA’s true heavy hitters. Based in Albany (400km south east of Perth) and with multiple stables in Ascot, SJ Wolfe Racing is the only country-based operation with a full time satellite establishment in Perth. And it is this point of difference that gives SJ Wolfe Racing an edge over its rivals. Horses located in Albany are able to train on the racetrack, beach and through the bush for 12 months of the year. And naturally most thrive in the rural setting. Horses stationed in Perth have access to first-class training facilities at both Ascot and Belmont racecourse, the epicentre of racing in WA. SJ Wolfe Racing has been the dominant force in the Great Southern (Albany and Mount Barker) for the last 20 years, and has consistently topped WA’s leading provincial and country training premierships. By acquiring quality yearlings over the past five years, SJ Wolfe Racing has shifted focus to metropolitan racing and is poised to be a permanent fixture among the top 10 stables in Perth. SJ Wolfe Racing is committed to taking horses where they can win and delivering clients a value for money experience. The stable also prides itself on being one of the most social in the state, ensuring its large network of clients enjoy themselves both on and off the track. SJ Wolfe Racing has already experienced major successes with former top class gallopers King Brian, Mapperholic, Moodometer and Wolfe Dreams. They are now focused on developing their large team of young horses – headed by Trichologist and Mr Utopia – into stars of the future. 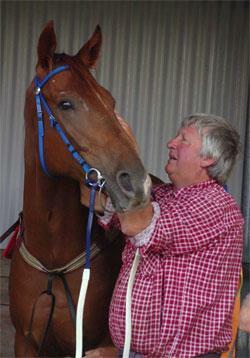 "Three dozen horses and two decades later I have never felt the necessity to change trainers. SJ is astute and forthright. He leaves no stone unturned to provide his owners the best possible return on investment."